Filmposterprofessor Wim Jansen is a little nervous. He wants to expound Eastern European posters, but they are somewhat ambiguous and his explication is rather abstract too. Nothing divides collectors as much as Eastern European posters. 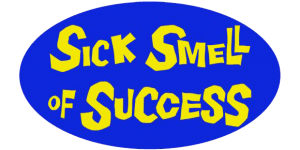 On the one side of the argument are people that almost reach ecstasy when they hear the magic words ‘Polish’ or ‘Czech’, on the other side are the haters. Bone of contention is the absence of clarity of a lot of these posters. In earlier posts in OLD PAPER I wrote about the importance of a clear message and a good likeness. Clarity implies reliability. The better the perception of a natural likeness, the more reliably we perceive it. The subjectivity of an artistic interpretation damages the reliability of the image. Check with any politician and he or she will concur with that statement. Eastern European posters lack often clarity or are sometimes outright abstract. It is often stated that this is because of the designers have not seen the movie with the resulting lack of reference material. This generates probably from the assumption that western movies were not shown behind the iron curtain. This misconception is at least denied by the multiple volumes of the Czech movie magazine KINO from the 1950’s to 1970’s that I have laying around here. These are filled with reviews and critiques of all kinds of western movies. Something different was going on. Eastern European designers did not have to tempt as much customers to the cinema as possible, they were led by a cultural tradition of graphic design and poster art. That tradition was especially nursed in Poland. Competitions were held as were prestigious poster-biennales, a poster exhibit was as usual as one of paintings. It’s not so strange that when looking at Wasilewski’s posters we don’t have much use for Duke Wellington, the capitalist prophet of the clear message (singleness of effect), about whom I wrote in earlier posts of OLD PAPER. There are other factors, next to a good likeness, to take in account that influences our minds when we look at images. Factors like color, depth, lighting and clarity play a part in how “true” we judge an image. Everyone that has used the filters of the Instagram app will have a sense how manipulative those factors are. 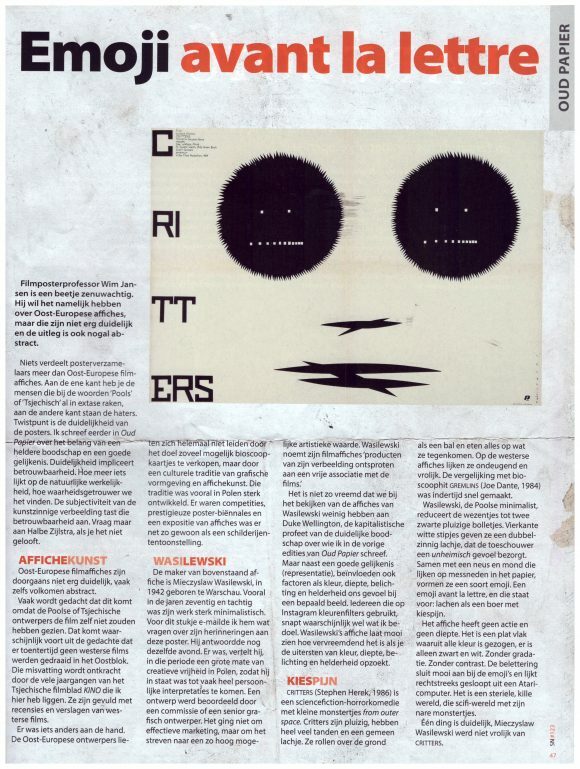 Wasilewski’s poster of CRITTERS shows what great alienating effect can be created with an extreme use of color, depth, lighting and clarity. 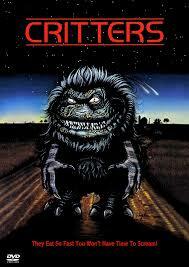 CRITTERS (Stephen Herek, 1986) is a science fiction-horror comedy with little monsters from outer space. They are kind of fluffy, have a lot of teeth with a mean little smile on their faces. They roll along the ground as a little ball and eat everything they encounter. On your regular Hollywood movie poster they look naughty and cheerful. Comparisons with box office smash GREMLINS (Joe Dante, 1984) were quickly made. 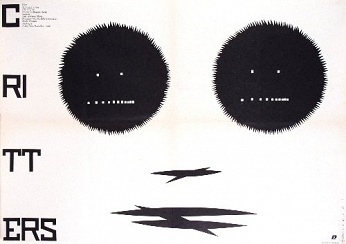 Wasilewski, the Polish minimalist, reduces the little creatures to two black fluffy spheres. Square white dots provide an ambiguous smirk that bring a sense of eeriness. Put together with a nose and mouth that look like knife cuts in paper they resemble a kind of emoji. An emoji avant la lettre which means something like “happy/not happy”. This poster has no sense of action and has no depth. It’s a flat space from which any color has been sucked out, there’s only black and white. No gradation. No contrast. 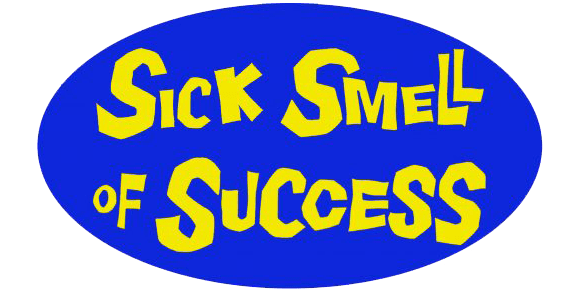 The lettering fits very well with the emoji and looks to be disassembled from an Atari computer. It’s a sterile, chilly world, this sci-fi world with it’s nasty little monsters. I think it is fair to assume that Mieczyslaw Wasilewski was not a fan of critters.